Where "Top - Of - The - Line" is on "Top - Of - Our - Shelf"
All of the Console Vault products are handcrafted in the USA, using the finest quality materials. These vaults have been engineered to fit perfectly inside your Ford console. 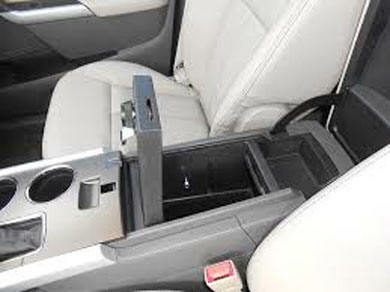 Once you lock the Console Vault and close the armrest on your center console, no one will be able to see the vault in your car. 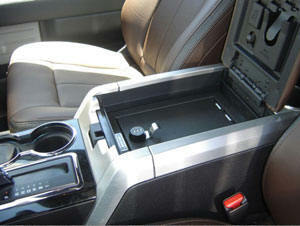 The installation of the Console Safe does not alter the original integrity of the vehicle. No part of the vehicle is cut, drilled, modified, or damaged in any way. Existing factory console bolts are removed and replaced. Leased vehicles are not damaged in any way, and will allow the vehicle to be returned to the dealer in its original condition. 1. Determine your seating configuration of your truck, it's either a bench seat style which requires an arm rest model or it has bucket seats, which require a full floor model. 2. 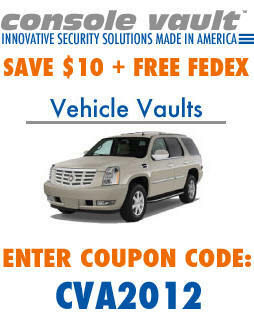 Find your vault model number below or select it from the drop down menu after clicking the coupon code below. You will be given a choice of either a 3 dial combo lock or a key lock for securing your vehicle safe. The Ford Console Vault was designed with bank vault technology to help protect contents. The Console Vault is the only mobile safe that features a unique three-point, high-security lock system that cannot be defeated, even if drilled. Console Vault has a "Triple Guard Lock System" incorporated as a latch design like the pins in bank vault doors which greatly increases overall security. This design also includes a front channel which incorporates the lid into the body of the vault, the concept also eliminates all stress off the physical lock itself. This is the finest, most secure product Console Vault has ever made. 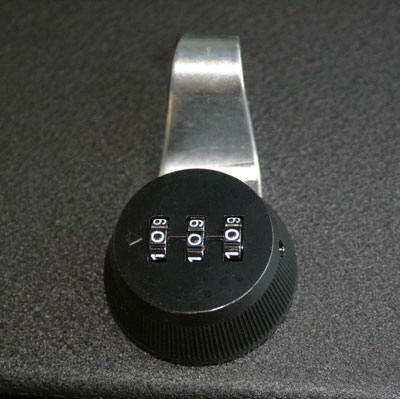 Each of the Ford / Lincoln Console Vaults offer the choice of a key lock or a 3 dial combo lock. Select your preference from the drop down menu. 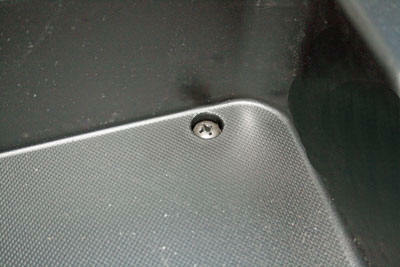 The following are the features of the Console Vault Locks built into the Ford truck safe. Each Console Vault is finished in the factory with an industrial grade high-quality powder coat finish that looks like paint, but acts like armor. Powder coating is a dry finishing process used to apply paint to metal surfaces. The safe is placed into a curing oven and covered with finely ground dry powder of colored pigment and resin. While inside the Console Vault is electro-statically charged. This process causes the powder sprayed onto the vault to melt and fuse into a solid coating on all of the vault's metal surfaces. The end result is a tough, good looking, scratch resistant finish. Installation is complete in 10 to15 minutes. Since the Console Vault is made to fit into the existing truck or SUV console, the installation involves removing using the existing factory console bolts. Simply remove the factory screws from the console. Slide your new Console Vault into the existing console tub, and re-screw the bolts you removed originally. 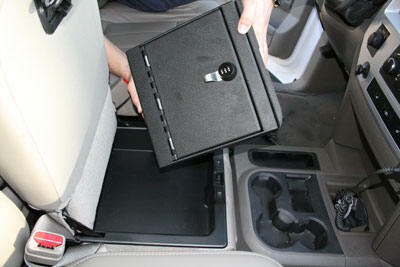 Once your replace the screws, the Console Vault is now securely mounted to your vehicle’s metal body. Below the factory plastic console tub, there is a steel mounting bracket with welded nut plates. These 2 screws (sometimes 4 depending on the vehicle) attach through this mounting bracket, providing plenty of security. That’s it! 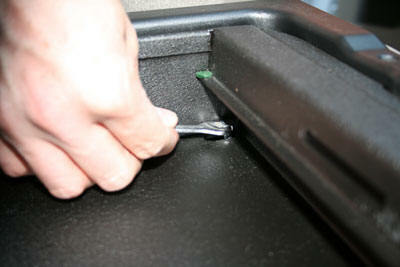 Step by step installation photographs see how easy it is to install a Console Vault is shown below. Click Here. 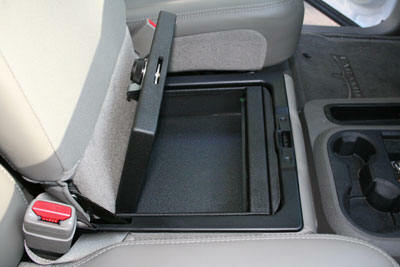 Console Vault mounted inside the console of Ford Edge. Note: If the gear shifter is on the steering column, the F150 Flow Through Console will not fit. *SYNC SYSTEM factory USB adapter mounted inside the console. 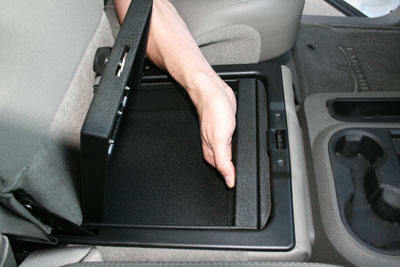 Firearm Safety -- Is Your Handgun Secure in Your Truck Without a Ford Console Vault Truck Safe? It is your responsibility to know the law and to act accordingly as it applies to properly and safely storing your firearms. What do you do with your handgun when you need to go into a location which restricts your ability to carry it? Do you place it in your car glove box, trunk, or hide it under your car seat? These practices are very irresponsible, and in some cases illegal. Law enforcement officers especially off-duty, frequently face the concern on how to properly and responsibly secure their weapon. Many public venues such as concert halls, stadiums, and amusement parks will not allow anyone, including law enforcement, to carry a firearm inside. Made of rigid 12 gauge cold-rolled plate steel, the ConsoleVault features rear locking pins similar to those found in bank vaults and an exclusive three-point locking system that cannot be defeated, even if the lock is drilled. The quality is unsurpassed in the industry and comes with a limited lifetime warranty. 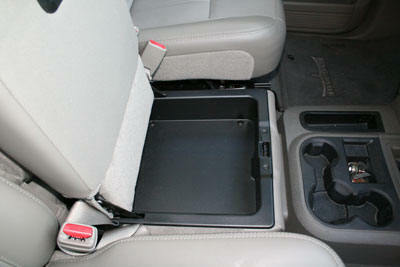 ConsoleVault's are the ultimate in truck accessories for your Chevy, Dodge, Ford and Hummer SUV or Truck. 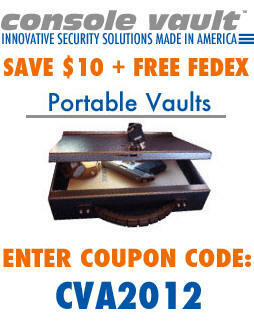 Console Vault provides government officials and consumers the latest in covert vaults and safes. From Console Vault's innovative Vehicle Vaults that provide additional peace of mind for vehicle owners, covert wall safes and vaults capable of outsmarting the most hardened of thieves, to the latest in security briefcases and gun and document transporters, Console Vault enables you to keep your valuables both safe and secure. Whether you're looking to keep your firearm secure in your SUV or ensure your most confidential documents travel with the utmost security on a transcontinental flight, Console Vault is the premier source for all of your high-security storage solutions. 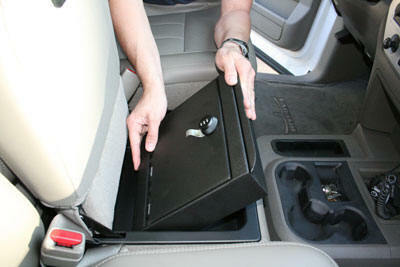 Console Vault's covert safes and vaults have long been a favorite by those with high-security needs. Whether a law enforcement official in war torn Iraq or a business executive within a highly competitive industry, some of the world's most influential people have trusted their valuables with Console Vault. For over eight years Console Vault has created specialized Vehicle Vaults for law enforcement officials and others looking to equip their vehicles with the finest in protection and security. Featuring Console Vault's superior five-point locking system and a high-security barrel lock with an optional keyless combination lock, each Vehicle Vault receives the finest attention to detail by our expert craftsmen. Made of 12-gauge cold-rolled plate steel and refined with welded tabs and notch seams, the Vehicle Vault is the preferred automotive safe for thousands of law enforcement and government officials from around the world. And as with every Console Vault product, each Vehicle Vault is proudly made in the United States. 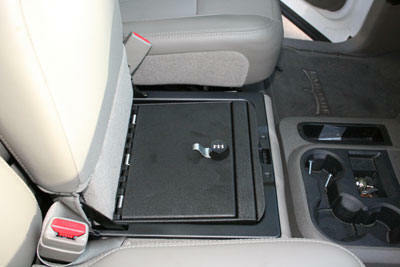 The Vehicle Vault discretely fits inside the existing consoles of most trucks, SUVs and more. With the Vehicle Vault installed and the console lid closed, the Vehicle Vault remains completely hidden from view. The Vehicle Vault is only exposed when the console itself is opened, preventing you from attracting attention to your valuables. The Vehicle Vault requires absolutely no modification to your vehicle's console and assembly takes less than ten minutes. Your original console can open and close just as it normally would, yet with the Vehicle Vault in place your belongings are now treated with the security and safety they deserve. Whether you're looking for a portable gun transporter or a Vehicle Vault for your Cadillac Escalade, Console Vault has a solution for all of your security needs. Have a question you're not finding the answer to online? Please contact us! Our personable and knowledgeable staff is here to address your security needs and answer any of your questions. See a step by step explanation on how to install a steel Console Vault. In 15 minutes you will have a hidden and secure place for your valuables within you center console without any damage or modification to your vehicle. Dodge truck. The Console Vault is custom made to fit in the existing OEM lower console tub. No special tools are needed. 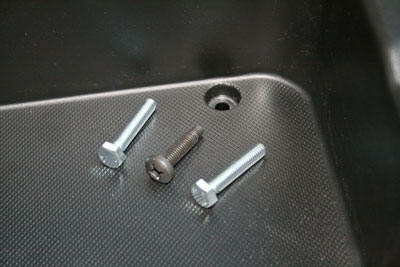 When you look inside your OEM tub you will see 4 screws, one in each corner. These are all you have to remove and replace. 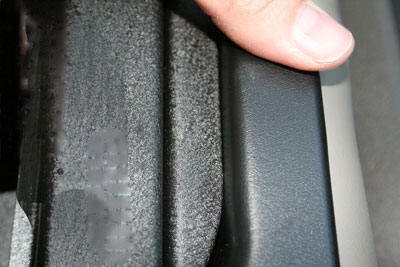 No drilling or modifications are required to your vehicle or center console. 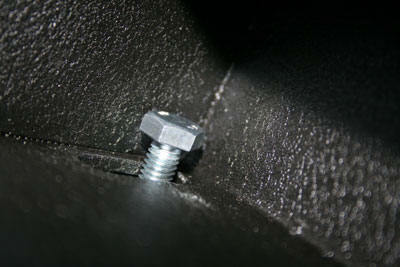 This shows the OEM screw that is found in each corner or somewhere in a vehicle's existing console tub. Each vehicle might have these screws in different locations, but all will be in the bottom. Simply use a Phillips screwdriver to unscrew the OEM screw. Once the screws are removed, your Console Vault is ready to install. Slide the Console Vault into place. The Console Vault is customized to the size of the existing opening. Once the Console Vault is slid into place, open to the vault door. 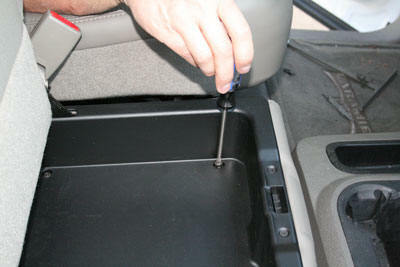 Use your hand to make sure the Console Vault is fully seated against the bottom of the OEM lower tub. Since the Console Vault is a custom it, you may have push down on the front section to make sure it is properly seated. Once seated, your should be able to run your finger across the front of the existing OEM tub ridge and run it back across the front lip of the Console Vault. The Console Vault should be flush, or a little bit lower of the front ridge of the OEM tub. Once seated, you do not use the old OEM bolts (in the center). They are too short, and are to be replaced with the included bolts. The existing OEM tub, along with your new Console Vault are secured to the frame of the truck, which is underneath the OEM tub. You place the bolts in each hold and begin the thread process with your fingers until snug. Tighten down until the bolt is flush with the bottom of the Console Vault. The Console Vault is now bolted to the truck frame, providing strong anti-theft protection for items left inside you console. The only thing left to do is reset the combination of the lock located on the top of the console vault. This is easy to do and the instructions are provided. This photograph shows the final installation photo of the Console Vault. The Console Vault is well made, and looks like it came standard from the factory, can cannot be seen from the outside of the vehicle.